So what’s the difference between a circus and a carnival? At a circus there are more performers and acts than at a carnival but other than that they are very similar. 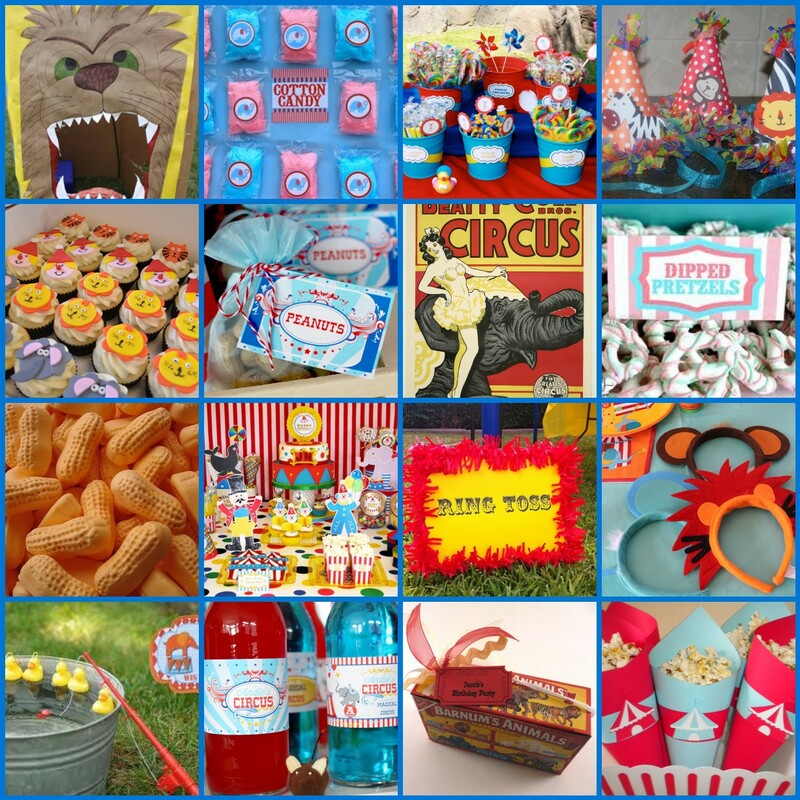 However, since I have had so many requests for this kind of “kid’s birthday theme” I decided to put together an inspiration board for a circus as well as the one I have previously posted for a carnival. I also wanted to include in this post some ideas to make your event successful as well as not being too expensive. I mean you could hire some clowns and jugglers… but why not let the kids be their own performers at this event? Break out the old Halloween costumes and let the kids dress up. Set up your own little stage and let them perform! You can even make your own “photo booth” and have someone there to take the kids pictures. You can make your own simple circus games too. By using oversized boxes you can draw a big picture of a lion and let kids toss bean bags into its mouth… Or take pictures of them “taming the lion and putting their heads in its mouth”. You could have a parent paint faces, or if you aren’t feeling too artistic use temporary tattoos. With a stick and some painted Styrofoam balls you could make a barbell and let the kids become the “strong man”. Keep your food options simple… Pop some popcorn, grab some animal crackers and bake up some corn dogs. If you want to get a little fancier you could make caramel or candy apples, dip some pretzels in chocolate, make some fresh squeezed lemonade and either buy some cotton candy or rent a cotton candy machine. No matter what you decide it is all about letting the kids explore and have fun! Isn’t that what birthday parties are all about? So let your inner child come through and have an amazing circus, carnival… or whatever birthday!